Sorcery Saga: Curse of the Great Curry God is a cutesy mystery dungeon style game where players must guide Pururu through several dungeons in order to obtain the ingredients for the powerful and mysterious legendary magic curry. It also has a long and silly title, which is a good fit for the plot, as you will read below. Cut scenes in the game have nice anime images, but the game itself is 3D with super-deformed (big heads, small bodies) models. The different dungeons, while having randomly generated floors, look different from each other and look kinda cool. I actually really like the character artwork for the cut-scenes. While the game is only in Japanese, there is a lot of spoken dialogue. Most story lines are fully voiced, plus a few lines for the different places you visit in town. There's even a bit for the non-sequitur scenes in the library. The music is pretty decent too. My two favorites are the boss theme and the song that plays when you encounter a "monster house" (a room that spawns a lot of monsters near you). The story of the game is really silly, and revolves around Pupuru, a girl who gets kicked out of mage school and decides to instead assemble the ingredients to the legendary magic curry. Why is she doing this? Because her friend owns a curry shop that is getting run out of business by the giant mega-corp curry store and its mean leader. So, she hopes that serving legendary curry will bring business back. Along the way, she meets a few... shall we say strange... characters. There's the wannabe heroic trio that bumbles their jobs, the evil magician who gets repeatedly mistaken for a pervert and even an demonic overlord who falls in love with her at first site. The story, while not serious, is actually pretty funny and I enjoyed it. The dialogue is good, and I laughed at many scenes, especially those with Zeo, the "perverted" mage. The story bits are interspersed well in each dungeon, with a scene occurring every 3-10 floors, depending on total dungeon length. There's even special items that when collected, unlock a non-sequitur scene in the library. Sorcery Saga is a mystery dungeon style game, so floors are randomly made when you enter them, and each dungeon has several floors each. Items and enemies are randomly placed around the floor, too. Also, dying will have you lose all your items, money and return you to town. Yeah, it's harsh, but that's the nature of the game. Any experience you gain in the dungeon is lost when you exit. You'll still want to kill what enemies you can, since you level up quickly and it is very helpful to your survival. The other trademark of a mystery dungeon style game is that it is turn based, so whenever you take your turn, all other enemies also do. Between each turn, you have as much time as you want to decide what to do or look at your inventory. Before you enter a dungeon, however, you must traverse the forests. The forest before each story dungeon is set at three floors and the map is always the same. I'm not too crazy about this feature, since it basically adds three floors to any dungeon, making it longer and adding more things to fill up your bag. It might not seem like much, but when going down 20 or 40 floors, the extra makes it that much longer. Dungeon lengths themselves are a bit much for a portable game, but thankfully the Vita's suspend function makes it seem less so. Also, while on the subject of items, your bag fills up quickly. There are ways to deal with it, but being able to hold more would have been nice. Following Pururu around is the mysterious Kuu creature. It will eat just about anything, and is mostly used to dump your unwanted items. It does help in combat, but likes to get in the way, or get itself killed, limiting its usefulness. You have to at least keep Kuu alive if you want to go to the next floor, so you can't just ignore it. The upside is that it learns skills as it levels up, and a few of them are really useful. One will auto-identify all items you pick up, while another will allow you to fuse items for free, once per floor. My favorite is Kuu Case, which effectively gives you another 8 slots of inventory. On the other side of the coin, there are a few skills that really hurt you, especially "So Hungry", where Kuu will eat any items it walks over. Yes, it will even auto eat the ones that damage it, or outright kill him. The skills it learns at level up are random, and it can hold 4 at a time. Kuu's level is also reset when you leave the dungeon, and its skills are lost, too. You will learn to put up with Kuu because you have to, but it tends to be more trouble than its worth. You can have up to eight skills equipped, and each one has it own set of uses per dungeon, which I liked. Your learn new skills by reading books, and many of the skills can be powered up by reading another of the same book. I kept a few magic spells and physical attacks on my list, and rounded it out with a few support, namely, the appraisal skill. It's really handy to find out if the unidentified item you picked up is even worth lugging around. Normal attacks are just done with the X Button, but the weapon equipped can effect it in fun ways, all because of "seals". Seals are basically passive skills that you can put on a piece of equipment. For weapons, you can attack two or three panels in a line in front of you, or a column of three in front of you. You can apply different elements or status effects to your attacks. Some are super useful, and can easily be placed on any weapon you want to use. Since you don't keep your level upon exiting the dungeon, the best way to make yourself stronger is by strengthening equipment. There are two ways to do this: using it and fusing it. Using it is self explanatory, and will change its name and make it stronger plus it increases the number of slots it has for extra seals. Fusing is a bit more complicated. You can increase the rank of a weapon by fusing it with a weapon that has a rank (ie: +2), and the ranks are added together. You can only get this benefit if the items are of the same type, like two staves or two shields. Skills can be transferred between types, as long as the items can actually grant that ability. The tutorial explained it, but I didn't realize at first that you only increase the rank if you fuse items that have a rank. Once I got that down, I was making better items in no time. I really like this part of the game. Sure, it could be deeper, or allow me to replace abilities I no longer want, but with some time, effort, and luck, you can make some really powerful pieces of equipment and smash your way through the bosses. The enemies you encounter are only half of the dangers you face. Many do things that are just plain mean. There are fish maids that destroy items lying around (by "cleaning" them), enemies that steal your stuff and even ones that change or destroy things in your inventory. It can get annoying to have a rare item get completely ruined because a monster came up and just destroyed it for no reason. The other half of the dangers are the trapped chests and some of the items. Chest traps can range from the mild, like dropping you down a floor or damaging you, to the severe, like dropping the rank of your equipped items by 3. Ouch. Some items you find literally have no positive uses. Here's my favorite: there's a scroll that makes you lose all your current money. Why would you even put that in a game? Throwing it at the enemy does almost no damage, so I have no idea what you would want to use it for. Overall, my biggest complaint with the game is just how mean some of that stuff is. The game itself is a little short, as there are only 5 real dungeons to explore in the story. They get long quickly, and beating the game will unlock some more to dive into. Even so, it can take a few trips through the dungeons, depending on if you get good drops, get into trouble, or even get defeated in them. If you are so inclined, there are also books that collect all the different items and monsters you encounter, and weapons and shields must be used to unlock higher versions, so repeated trips will be necessary to fill them out. You can also unlock costume pieces for Pururu by completing dungeons many times each. Considering the dungeons are random each time you enter them, repeated trips are not near as boring as it might sound. If you want to do a lot in the game, there is lots to do. If you just want to complete the story, it can take anywhere from 10-30 hours. Although, the in-game clock will not stop if you put the game in sleep mode. Not a deal breaker, but always a pet peeve of mine. While I played a lot, I'm sure I haven't played the game for the equivalent of 8 days... yet. Some trophies are acquired from making your way through the story, and the higher ones will have you fill out the monster and item books, which can take a good chunk of time and effort. There's even some for being defeated... so you at least get something for losing your stuff. The hardest trophies on the list are mostly just time consuming, not actually difficult. There are a few DLC costumes for the game, but be warned that you only have access to them while you are connected to the internet. Sorcery Saga is a fun game, although it can be really mean. It adds some new mechanics to the genre, like the forest maps and Kuu, but they are a mixed bag. Making items is fun, the story is humorous, and the characters are likable. All in all, a fun game that can be played in bursts, but is best left for when you have a chunk of time set aside to traverse the dungeons. I frequently found myself going back to play it for a few minutes, only to sit there for an hour dungeon diving and looting. About a year and a half ago, Rainbow Moon came out for the PS3, and it has now found its way to the Vita. The entire experience has translated very well, as it looks and sounds as good as the PS3 version. The world of Rainbow Moon is very detailed, from lush forests to cluttered basements. The music fits well for each location, and there even some voices in the game. It's not really spoken dialog as much as it is battle noises and mutterings from townspeople and shops when you speak with them. Still, a good visual and audible experience. While movement is done on an appropriate-sized map, battles are all done like a grid-based strategy RPG. You will have a limited field to move around on, and speed will determine turn order. If you have ever played Rhapsody: A Musical Adventure, it is similar to that. You move around a field, and contact with an enemy or a random encounter will shift the battle to a small scale SRPG field. At first, you only have one character and can take one action a turn. While it at first seems like there is no strategy involved in the strategy RPG, things change once you hit level 5 or so. That's when you get your first sub-action. Each sub-action allows you to do something in your turn, and your turn does not end until you have used them all or defended. Soon after you will get your first extra character, and the tactics start to become apparent. Should you move closer to attack or use a skill? Should you end your turn guarding or do one more attack to kill one of the monsters around you? Since bosses are a higher level than your party (unless you do a lot of grinding), you will need to use some tactics to defeat them. There's even a rock-paper-scissors like compatibility chart for weapons to further change up the battles. It is a lot harder to take advantage of that, since you can only have three characters in battle at a time and a character can't swap weapon types. You get up to six characters, each using one of the weapons types in the game. You can have up to three of them in a battle at a time, though. A character's MP is used for their various skills, most of which must be purchased in the game. The cost of each skill scroll will increase for any subsequent purchases, so if it's a skill that multiple characters can learn, expect to pay if you want to teach multiple people. Also note that being able to equip amulets is a skill, so you have to purchase that ability for everyone. Ugh. The skills themselves are pretty useful, but the area of effect is a bit odd. The effect square(s) is different from the targeting square, and the targeting area is where the targeting square must be. So, in essence, some skills allow you to hit outside of what you would normally consider the area of effect, but cannot hit right next to the user. It's strange, but you can get used to it after awhile. Fights can be a mixed bag. Most times, good tactics can overcome some uneven odds. However, random encounters have random assortments of monsters from the area. So, one fight might be against 2 of one enemy, and the next might be against 11 enemies of four different types. Some of the bosses have more than 14 extra monsters in the fight! The random fights definitely seems so, but thankfully you have to press the X Button to actually start the fight, so you can ignore them if you want. That's really helpful when you need to get back to town, or are making your way through a dungeon, or just don't want to fight 10 enemies that all can poison you. Speaking of that, poison is super powerful in the game. In battle, it only damages you at the end of your turn (not every sub-action), but it takes more than 10% of your max health when it does damage you. Ouch. Besides gaining stats upon a level up, you can visit a special trainer called a Savant and exchange Rainbow Pearls to increase a particular stat. I like that these can be used to tailor the character and either make them better at what they do or cover for a weakness. Each level has purchasing limits, and stats cost varying amounts of pearls, but it's still fun. The only problem I have is that only the character that gets the killing blow will obtain the pearls from the monster. This can make it harder for newer or lower level characters to catch up to the rest. The game can get pretty long. It can take about 40 hours to complete the main story, and much of that time will be spent grinding so you can effectively fight the enemies in the next area. If you intend to use more than the three starting characters, you will have to spend time to get pearls so their stats can improve. You'll also need to get lots of money to afford equipment and skill scrolls. It's very reminiscent of old-school JRPGs in those respects. Looking at the PSN store, there is a lot of extra stuff you can buy. Most of it is extra money and pearls for the characters. These are very useful, if only to cut down on the huge chunk of time spent grinding. However, that time spent grinding will help with the trophy for playing for 100 hours if you intend to platinum the game. There's also a trophy for hitting level 500, which will take a long time. Most trophies are for going through the story, and the last few are for spending lots of time with the game, getting lots of money and high levels. It's one of the better lists for an RPG, since I prefer most of them for going through the game and a few for things to be done after finishing the story, rather than several at the beginning, and most at the end of the game. 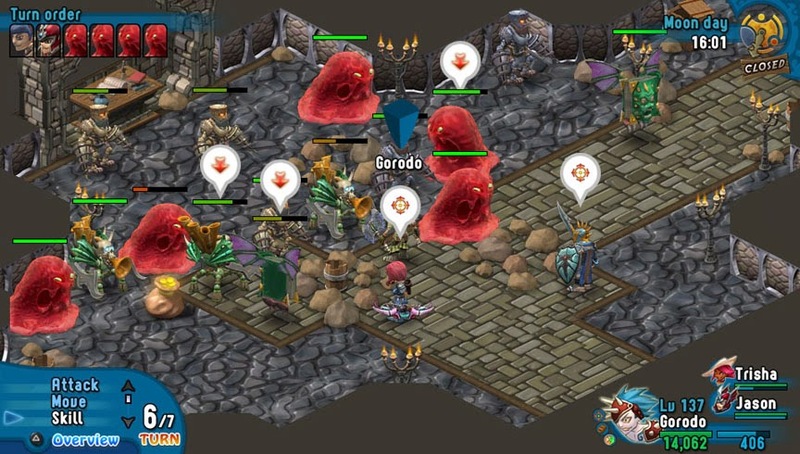 Rainbow Moon offers an interesting mix of traditional RPGs and strategy RPGs. Battles are entertaining and have some good strategy once you start getting characters, skills and sub-actions. The game is fun, but seems heavy on grinding. Time-wise, you do get a lot of bang for your buck. 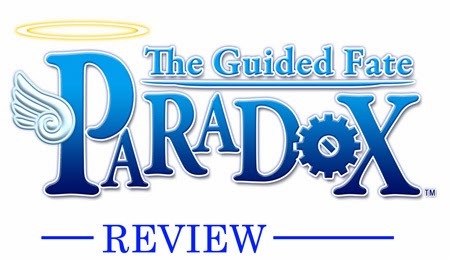 It's a good game for anyone that likes RPGs to check out, especially on the Vita. It's really good to play it for a few spare minutes or for a few hours. Ever since trying the demo of DLC Quest when it was released on the Xbox Live Indie games section, I wanted to play the full version. I picked it up during a Steam sale a bit ago and finished playing both it and the Live Freemium or Die sequel. The core of DLC Quest is to lampoon the industry and how it pushes DLC on the consumer. Boy, does it do it really well, too. 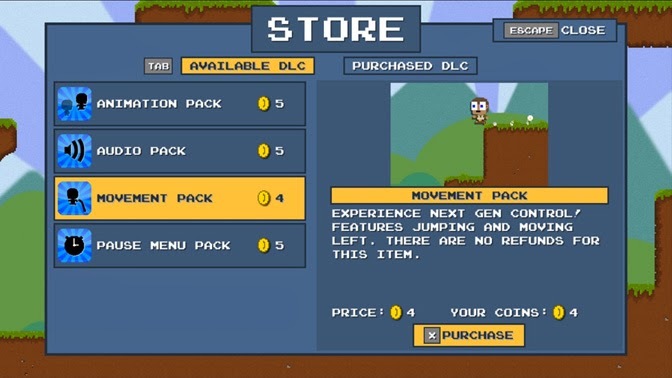 At first you can only move to the right and must "purchase" the DLC to be able to move left and jump. Now, I should clarify (since the game does too) that you purchase DLC packs in the game with in-game coins, not real money. It's a parody of the industry, not a money grab, after all. Besides not being able to move anywhere other than right at first, your character also isn't animated. That's an extra "charge". Did you want to pause? Get the DLC for it. Music and sound effects? Yup, gotta buy that from the store too. It's a bit heavy-handed in DLC Quest, but less so for Live Freemium or Die. However, that's really the point of the game, and it does it very well. The style of the game is a very retro 8-bit style, like the old Super Mario Bros. It looks fine (since I rather like old style-graphics) and plays well, even on my older PC. I would recommend using a controller for the game, since it is a platformer, and playing those on a keyboard is painful. I realize that might not be true for everyone, but it's great to have the option of using the keyboard or plugging in a controller. I used the Xbox 360 controller, and had no issues with it, even with the infamous D-pad it has. It took about 30-40 minutes to beat DLC Quest and get all the coins and awardments. Yes, there are fake achievements in the game, and they make fun of "real" ones as much as you would expect considering the nature of the game. There are a few hidden things (more in the sequel), and I didn't really get lost in the game. It wasn't very hard, since there are no real enemies, but more of a relaxing, comical take on the industry. The sequel, Live Freemium or Die, took about 90 minutes to beat, but there was one part where I was confused what to do to continue. It's also a bit more challenging, since there are enemies (remember to buy the sword DLC) and death traps, but still not very hard. In some ways, it's even funnier than the first entry. Early on there's a load screen, which will immediately stand out in a retro game, and you have to buy the "Day 1 Patch" to get rid of them. The game is funny, as does hit the nail on the head with a lot of its humor. As stated earlier, it's less heavy-handed about the whole "DLC being out of control" thing, however, it does still make fun of it... a lot. It's also a better game. However, they are both very much worth buying and playing, especially if you have a sense of humor about the industry or are just tired of so many things being piecemealed out of a game to be sold separately for the "full" experience. It won't set you back much time (or money if you wait for a sale), and is worth it for a good laugh. It's no secret I like the Phoenix Wright: Ace Attorney games. After playing the first one, and getting gripped by the story, I enjoyed the next two games almost as much. The Edgeworth and Apollo Justice games failed to grab me in the same way, so I was happy to see the next game in the series, Phoenix Wright: Ace Attorney: Dual Destinies was a return to playing as Phoenix (and a really long name). The previous games all had amazing sprite animation, so I was a bit hesitant when I saw that Capcom transitioned it into cel-shaded 3D graphics. It's not quite as good, but they are still done really well. The returning characters and all their various animations are faithfully represented. New characters have lots of animations and fit right in with the rest of the cast. Also, the 3D effect in the game is the best I have seen to date in a game. Besides all the playable parts being in 3D, the animated sequences are also in 3D, and they look amazing. This is so far the only game that I would actually recommend playing a lot with the 3D slider on. The flow of the game is relatively steady. You start off with a bit of story to set the (murder) scene, and the body is quickly discovered. You will gather some clues and talk to witnesses, piecing together some of what transpired. You will then defend your client in a courtroom battle. For any subsequent days (the legal system in the game allows for a maximum of a three day trial), you will do another investigation and then another courtroom section. The game can be played completely on the touch screen, or you can opt to use buttons. I usually use buttons for forwarding through text and selection locations to go to, and the touch screen for various other functions. One nice upgrade from previous games is the checkmarks on places and objects you have already investigated. No more poking around and hoping to find the exact pixel you need, since you can readily see what you have and haven't investigated yet. This makes it harder to get lost and/or stuck during parts of the game. If you have played any of the other Ace Attorney games, you know that there is an overarching plot that is connected to each case and gets resolved in the final one. The same is true here. The connection is not readily apparent, but by the end you will see how it all connects together. It's really well written and the dialogue and details tie into the main plot. Well, almost all of the details. There were a few things that probably aren't that important that just seemed to be dropped as the plot moved on. Without spoiling the story, there was a part during the fifth and final case where I thought we were going to have a crazy courtroom showdown, but it ended up not happening. There's also a twist that is well concealed, and ends up making sense, but I didn't want to happen. Mostly because it involves a character I liked. Besides that, there is some character development for Apollo Justice that makes him better in my eyes. If this game had come first, I would have been happy to play the game starring him, and I wouldn't have felt like he was just some terrible replacement for Phoenix. The returning mechanics of Psyche-Locks (for Phoenix) and perceiving people's lying (Apollo) are accompanied by new character Athena's emotional perception. During certain testimonies, she will turn on her computer (called Widget) and be able to sense the emotions of the witness. It is a fun mechanic, but it is definitely a video game mechanic. Most of the lines when pointing out things just feel silly, like "when you talked about that last part I sensed some happiness". If you are willing to look past the awkwardness of it, it's a fun mechanic and not too hard to use. Also, I should note that it feels like Apollo's ability has been made easier. He can perceive people's tells when they are lying, and they felt much easier to spot in this game. It might be because you don't use it very often, but I had no trouble spotting them this time. There are five chapters, and each one can take about 1 and a half to 3 hours each, depending on how much extra pressing and talking you do. Knowing exactly which item to present and when to do it will, of course, cut down that time. Like the previous games, the first case is also a tutorial, but thankfully it is a longer case and feels more like a "real" case than a tutorial one. There isn't much reason to replay the cases, other than re-experiencing the story, or to try and pick up any foreshadowing that you didn't realize was there. Thankfully, you can jump to different points in each chapter, so you wouldn't have to replay the whole thing if you only want to redo a specific part. Dual Destinies has some DLC, the first of which was a costume for each of the three main characters. It was free for the first month, and it was worth it to put Phoenix in his old getup. Yeah, it's pretty similar to his new stuff, but I had him in the old suit for the whole game. There's also at least one new case you can buy for an extra $6. The other Ace Attorney games had 4 or 5 cases, so I don't feel like this was content cut out of the final game so it could be sold separately. Phoenix Wright: Ace Attorney: Dual Destinies is a great game. The story is really good, the dialogue is top notch, and the 3D is the best I have experienced to date. It might not be quite as good as the first game, but it is still a game that fans of the series should play. If you haven't played any of the Ace Attorney games, I highly recommend starting from the beginning and play through at least the first three. Although, you don't need to know much about them to enjoy Dual Destinies, since they explain all of the important stuff from previous entries. If you like deep involved stories, or even battles of wits in the courtroom, give the game a playthrough and you'll have no objections! As a fan of Dynasty Warriors games and of Kamen Rider, I was very anxious to get my hands on Kamen Rider: Battride War for the PS3. Yes, this is from Japan. Thankfully, the PS3 is region-free for most games, because this game isn't coming out here. Was it worth the cost to get an import copy? Ride with me and let's find out... it's showtime! The riders and the enemies look good. They are both represented faithfully, which is a surprised considering how many models they have on the screen with no slowdown. By faithfully, I mean the riders look exactly how they should, and even have their mannerisms (Faiz's hand twitch, for example) intact. The enemies are destroyed in their own unique way, such as the worms exploding in green flame or the OOO enemies turning into coins. In short, all of the things in the game are legit. Maybe a little too legit, since the still pictures of the riders actually look like photos of the actors in the suit. Regardless, there's lots of good detail that fans of the shows should appreciate. The music in the game is decent. It seems fitting to the story parts and different parts of the stages, such as when you have to rush to a certain location or something dramatic is happening. It's disappointing that only the "premium sound version" has the theme songs of the different riders, and that apparently they will play when fighting the boss of the stage. As far as I can tell, and have read, the riders and characters are voiced by their actual voice actors, which is awesome. Although, I was a bit disappointed that the Kuuga in the game is the Decade version of Kuuga and not the original. The combat in the game is reminiscent of Dynasty Warriors, or more specifically like Sengoku Basara or Bleach: Soul Resurreccion. The square button is your standard attack string, while the triangle and circle buttons are your special attacks. Pressing both the triangle and circle buttons together is usually a character or forms' finishing attack, which you must do to the bosses to finish them. That in particular, while sometimes annoying, is really fun since it is so accurate to the show. The last main attack is square and X together. Like an EX move from Street Fighter, it takes some meter, but is a stronger attack that also shrugs off hits. It can be useful to use to escape a combo, but I rarely used it. Pressing the R1 button will usually cycle through the forms (or cards) available for your character, while holding it down will activate said form or card. L1 is the block button, useful for, well, blocking. L2 will summon and mount your rider's motorcycle. This can be useful to get to farther places on the stage in a hurry, or to collect the point rings in some stages, but the bikes can be pretty unwieldy. After getting used to them, as they all behave a little differently, I can say that riding the bike is best used sparingly. When the meter under your health is full, pressing R2 will activate your super move and put you in your super form. The super form only lasts as long as you have meter left, so use it wisely for big combos or to finish the bosses in style. Overall, the controls work fine and I had no trouble with combat. The biggest issues are controlling the bike, and sometimes I would press the button for the bike and try to quickly accelerate... only to have it not register the L2. That meant that instead of accelerating the motorcyle, I used my super move. I'm not sure if it's an issue with the game, the controller, or muscle memory, but I know it's happened to at least one other person. One of the less impressive parts of the game is the different stages. There are basically seven locations, the warehouse district, the quarry, the mountain forest, the city, the school/moon base, the snowy area and the underground. The last two are very small, but they are in fact different, so I counted them. You will see each of these locations multiple times throughout the different levels in the game. While this feels accurate to the show (they always seem to fight in a warehouse or at an abandoned quarry), more locations, or different variations of the ones presented would have been nice. While there is a less than impressive array of stages, the opposite is true for characters. The latest 14 main riders are all present, along with their different forms. Most forms are unlocked with enough levels, or attained for a limited time after filling your meter and activating your super attack. Several of them change the standard combo and special attacks completely, so they are almost new characters. It's really cool that each character can change so much, since you technically have lots of different characters to use and have fun with. Although I would love to play as more of the secondary riders that are actually present in this game, and some of the pre-Kuuga riders (Showa Era), the character selection is really good and done right. You can also equip up to three figures on each character, providing different bonuses like increased attack strength, heath regeneration, earning more shop points, etc. Most figures are unlocked by buying them in the store, and there are a few that have overlapping effects. The figures available are good choices, since some are from the different forms, secondary riders and other things not usable in this game. I'd advise looking up a list of the different figures, then get the best ones (increased shop points and experience) as early as possible. The story mode is 50 stages and can take about 20 or more hours to get through. Once you finish the first few stages, you can freely choose to start the next three chapters in any order you want. The basic structure for the first half of the game is to do a stage where you defeat a rider and the secondary rider from a show, then the next stage has you play as that rider, and defeat their featured villain. Completing this second stage then unlocks the rider for play. After unlocking 4-5 riders in a chapter, you will have a final stage that furthers the plot. The second half of story mode is continuing the plot to its resolution. The language barrier might not prevent me from the menus or equipment, but it did prevent me from understanding most of the story. I could piece together some of it, but I'm betting some of it just passed me by. The other main section of the game is Rider Road. You will be tasked with completing three preset stages (listed beforehand) with no healing in between, but you get stat boosts once they are done. They use the same stages as story mode, complete with cut scenes. It's a little lazy, but getting stat boosts makes up for it. You can also replay any stage in Free Mode, which is nice for grinding experience, shop points, or driving distance. There are two DLC characters for the game. They are free, but require you to create a Japanese PSN account if you don't already have one. You will have to navigate the Japanese PSN store to find them, but it's worth the trouble. Most of the trophies for the game will be earned by completing the story and rider road sections of the game. After that, the ones most likely left are the grind heavy ones, namely acquiring all the figures, driving a total of 555km, and having over 100,000 combo hits total. The first two in particular will take awhile, since there are some expensive figures and you don't drive very far in the different stages. I really like Kamen Rider: Battride War. It's a good Kamen Rider game, and is even a decent hack and slash, more so if you know who most of these people are. It's fairly import-friendly, since it is on the PS3 and the menus and such aren't too hard to figure out. My only complaints are the lack of stages, and having more playable secondary riders or the riders from before 2000's Kuuga. If they continue to add more riders in subsequent games, like Dynasty Warriors, I will gladly look forward to more of these games being released. Clock over! The four main characters of Final Exam were making their way to their high school reunion when they discovered monsters. Now it is your task to survive in this side-scrolling co-op action game. The story is told in the same style as motion comics, so there are mostly still images with voiced dialogue on top. It looks good and the scenes are succinct enough to not get in the way of playing. The first objective of the game is to fight the monsters in an effort to survive. Attacks are done with the X Button, and are broken up into a standard combo, a launch attack and a smash (knockdown) attack. You can get an air combo too, if you want to be fancy after launching an opponent. Enemies attack frequently, so you will need to make use of your dodge. This is done with the Y Button, which took me a while to get used to, since I don't think any game I've played had the Y Button as a dodge. The Right Stick aims your firearm (Right Trigger) and explosive (Right Bumper). The B Button is your multi-purpose button, allowing you to climb staircases, grab mission objectives or place objects. To round out the controls, the Left Trigger will pick up objectives (or enemies) and the Left Bumper is used to activate your special moves, once the corresponding upgrade has been purchased. The controls all worked fine, once I got used to the Y Button for dodging. At first I would try to be fancy and launch enemies so I could combo them in the air, but this was not necessary. It was far better to just combo them normally. Yes, you get less points for not being fancy, but it was easier to just keep it simple when there are numerous enemies around, all trying to kill you. Enemies will roll out of your combo when they get the chance, so you need to pay attention and stay on them. The air combo and smash are very useful on the airborne enemies. Shooting enemies didn't always stun them, but it's great for the enemies that like to hang on the ceiling to attack you. The enemies are also really aggressive, and frequently ignore being shot and on fire to run up and attack you, so keep on your toes! The secondary objective of the levels is to find your way to the exit. This can involve escorting people, finding items that people need or finding switches for doors. You'll do this while enemies come at you a few at a time, with an occasional horde of enemies to halt your progress. Even though the enemies will continuously spawn throughout the level, it's worth fighting them. Not only will this increase your score, but running away won't help, since baddies will re-spawn near you if they get too far away. It can get frustrating when you are being hounded by monsters while trying to carry a crate to a location, or have a horde spawn while you are grabbing an objective. Usually it's not too bad, but on the occasion that there are multiple types of enemies mobbing around you, it can be hard to see where you are, and even harder to avoid it all unscathed. The levels themselves are pretty expansive, with lots of room to explore. Every so often the game will mix things up with something new. One section has you atop a subway car, dodging signs, while another has you riding on a flying enemy, mimicking a shoot-em-up (shmup). These sections are fun diversions, but they do tend to last a little too long for my liking. The shmup section in particular was my least favorite. It's just too long, and you use your equipped gun. They do give you ammo during the section, but not enough to actually be a shoot-em-up, so it's really more of a fly and hit things (faht?). When playing co-op on that section, you also can't revive someone that dies, making it harder than it should be. That was kind of a let down, since I really enjoy shmups. While collecting weapons has an obvious positive effect, finding both them and the cans scattered throughout the stages also levels up your character. Finding all the cans and both weapons in a stage will each grant 1 CP, which is used to upgrade your stats, like health and damage. Completing the level grants you 1 SP which can be used to purchase passive and active skills. Your score at the end of the level will also grant up to 3 SP. Obtaining all of them in a particular level will get you the "golden glove" rating for that stage. Getting a high score is where the best mechanic in the game comes in. Your combo will help determine the amount of points you get. Getting hit breaks your combo, so dodging is very important if you want get high scores and the associated SP. However, there are times when there is a lull in the action, or if you want to guarantee the large bonus from a combo. Manual validation is used to get the most out of these situations. Your combo counter and bonus score will remain until you are hit or decide to cash it in by pressing down on the D-pad. This is a great mechanic. You can play it safe, go for broke, or somewhere in between. Just make sure to turn it on in the options, and you should see your score soar! Not counting the tutorial, there are 8 different levels to play, and they each run about 30-40 minutes each. There are also four characters, each with different skills and max stats, so you can find one that fits your play style. If you are a completionist, you will likely go through each level at least twice so you can get the collectibles and the CP from the score. If you want all the achievements, you'll want to find all the collectibles, weapons, get all character points, complete every level on hard, and play a level in both co-op modes (local and online). The game can get pretty challenging even on the regular setting, so you will want a maxed out character and probably some friends if you hope to tackle the "rock hard" difficulty (especially the last level). Of course, the game is centered around the co-op experience, so I would be remiss if I didn't explore that as well. Being revived instead of losing a life is great, as is getting protection for the sections where you must carry items around. The game makes up for this by throwing more enemies at you, but you don't seem to get more item drops. Also, local co-op shares the bonus counter, so either player getting hit will break it. The trade off is that it does increase faster, but is a lot harder to maintain. Online, however, is much better. Without being tied to a single screen, each player can run off and do objectives separately, making the levels much faster and less tedious. Bosses will have a lot more health, though, so be careful on those parts. Other than that, playing co-op, especially online, is where the game is the most fun. The single player experience of Final Exam was enjoyable enough, but had frequent frustrations. It can be easy to lose where your character is when swarmed with enemies. However, pulling off impressive combos and getting a big bonus is a lot of fun, and was playing online co-op. Destiny of Spirits is a free to play RPG on the PS Vita. For battle, you use a party of three monsters to battle other monsters. There is a little meter under each monster that fills, and when filled, the monster will attack. Each monster also has a special ability that uses a communal SP meter that refills between missions. The targets and menu options are mapped to the touch screen, and it responds really well. Just like most RPGs, there is an elemental chart where each element is strong against one element and weak to another. The game breaks the world up into a grid, and places you on it according to your location. There are a few missions per area, and once you finish them, a boss fight will appear. If you defeat the boss, that area becomes purified, and you can choose to do more missions in neighboring areas. I like that it your location changes your starting point, plus it shows you where your friends are on the map. Monsters you can get from summoning are dependent on region (America, Europe, Asia, etc), which would bother me more, but you can get those from the destiny summons (more on that below). Plus, it is really easy to send friend requests to other regions, and you can trade for monsters you may not be able to get. I wasn't able to try the trade function yet, so it might not be that easy, especially if you have to coordinate it. There are several ways to get monsters for your party. When starting out, the game gives you one. To get more, you can spend Summoning Stones, which can be obtained from winning battles, and at least in the beta, as a bonus for logging in. These can be spent to get a random summon, either common or uncommon. Destiny Orbs can be used to summon a random uncommon, rare or super rare monster. There may be something above super rare (maybe ultra rare? ), but I didn't see it. Some Destiny Orbs were given as login bonuses, but I suspect those will be purchasable in the store (the store option didn't work in the beta). They could be used to heal your party (they will heal after 30 minutes), increase your total monster capacity, and summon special monsters. The special monsters are only available for a certain time, and the ones in the beta were related to the Playstation cats (Koro and Toro I believe) and the characters from Gravity Rush. A pretty cool idea that they have Sony themed characters that you can get for your party... maybe we will see some God of War characters in the future, too. The other ways to get more monsters was a destiny summon that you can do once per day. When you log in, you can choose a person taken from a random list of other players, and it will summon two of a random monster and give you each one of them. It's pretty nice, and I actually got a rare monster or two out of it. You can rarely get a monster as a reward for a mission, and you can also "hunt" them. For this it requires location data, so if you use your Vita while travelling, you can probably get some nice new monsters. I was only able to use it once, unfortunately. To make the monsters stronger, you have to fuse others into one of your choosing. You can fuse up to five at a time into a chosen "base" monster. You get more experience if they are the same element, and presumably, more for rarer monsters or ones with higher levels. It would have been nice if you could see how much experience you are going to get before you fuse them, to see if it is even worth it, or if it's better to fuse more than two at a time, but they don't tell you until after it's too later. It wasn't that hard to get more summoning stones from fights so you could get more monsters to rais the level of the ones you like, but I would like to get the most out of what I'm giving up. To finalize the fusion process, you need to spend Spirit Points. For those of you keeping score, that's three different kinds of numbers you need to be aware of when not in battle. You can also use the Spirit Points to "rent" a monster from another player for a mission. It's a nice function, since the person you rented it from will get some of those points. It also allows you to try out other monsters you may not have yet, or get help from a higher level or an element that could help you out. You can't pick which monster it will temporarily replace, which is not a great thing, but you get plenty of Spirit Points, so it was a good thing to spend them on. Also, if one of the random people on your list is a friend, you get a discount for renting their monster. Every day you play Destiny of Spirits, your luck and elemental affinity will change. Affinity will change which element of your is stronger in battle, so take advantage of it whenever you can. Luck affects things like critical rate, drop rate and acquiring rarer monsters from the random drawings. If you are so inclined, Destiny Orbs can be used to boost your luck (or drop it) for the day. I think I got "average" luck every day I played (all 7), and didn't spend any orbs to increase it. Besides the special monster availability, the other timed event during the beta was a special raid boss encounter. The raid boss could appear in any zone you were in, but you could choose not to fight it. It's HP would not deplete if you lost, since you are meant to take it on with groups of other people. The one I fought was totally beatable solo, but I took me two tries and several monsters to win. Beating the raid boss at different levels and more times gives several rewards. The one I wanted was the playable version of the raid boss, but I didn't fight her enough. Still, I thought it was a neat idea to put into the game so players check back to see what new events will keep them playing or get them back into the game. Destiny of Spirits was pretty fun. I'm not sure how intrusive the shop will be, and how much money you will need to put in to get the Destiny Orbs, so it could still go horribly, horribly wrong. It used the Vita features well, but the reliance on having an internet connection can make it hard to play on the go (unless you have 3G), since I had to be close to my Wi-Fi access point to not error out. That also made each facet of the game take a bit too long to load. Other than that, I liked the game and will definitely try the full version when it comes out. It's a good pick up and play game. The premise of Foul Play is solid and unique. You play as Sebastian Dashforth, the renowned demonologist, and his assistant Scampwick, while he is performing a play about his life. As such, the only real danger you are in is from the audience growing bored. In a new and interesting twist, you and your partner do not have a health bar- instead you have the audience's mood meter. Performing high hitting combos, parrying attacks and fulfilling requests will make the crowd love your performance and allow you to continue the play. This makes it harder to lose as long as you are fighting guys and trying not to get hit. The payoff here is mastery, not completion. The art and style of this game is really cool. Since you are performing a play, all the action takes place on a stage. There is an audience in the foreground and curtains on the sides. The floor, background and props all change from scene to scene, further driving the theme. Finally, the enemies are actors as well. This is my favorite part, because when you get the more outlandish villains, like the squids and werewolves, you can see the person in the costume. It's a great little touch that completes the whole idea of this being a play. There's also a fair amount of comedy, like the stagehand/ janitor appearing in various capacities, vanquished enemies crawling off of the stages or being dragged off for their next scene... there's even one poor guy who forgot his line. The music is fitting as well, but the visual elements are the high point for me. 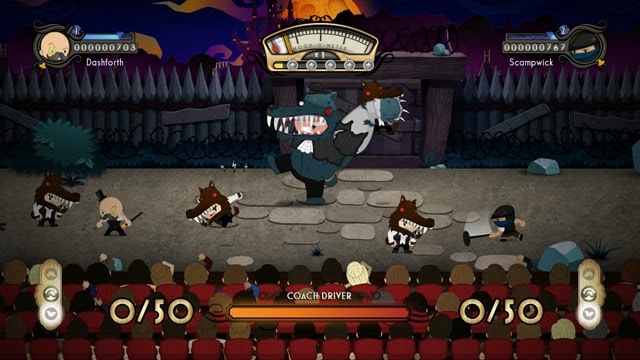 Combat is basically a side-scrolling beat-em-up game like Final Fight or Castle Crashers. You have a normal attack and a launch attack. Combos can and will extend into the air. There is a bit of tracking on the attacks, so you will move toward an enemy while attacking. When an enemy attacks, they will have 3 little lightning bolts above their head. Pressing the B Button will allow you to parry their attack. For the small enemies, this will cause Dashforth or Scampwick to grab them and perform some special moves to the hapless victim. You can increase your combo easily with the flurry attack, throw the enemy into breakable stage props or other enemies, or finally piledrive them into the stage, damaging other enemies nearby. These are easily the best moves the characters can perform, as they give you easy combos and crowd control. By gaining levels, you will get even more special moves. There's a powerful vertical attack, a higher launch attack, a non-parry air piledriver, ground pound and a baton twirl. I tried out these moves, but found them to be very limited in their usefulness. The baton twirl and ground pound would be the most useful, but the charge time lessens their usefulness. A charm exists that reduces the charge time, but there are better charms to use and more useful attacks. As it stands, the parry flurry, throw and piledriver are easily the most useful attacks in your arsenal. They will also be necessary to completing some of the challenges. The dodge maneuver is also useful for the times when the parry won't cut it. Overall, the combat is really fun. You get to smash lots of enemies, and the parry allows you look good while doing it. There's payoff for being both defensive and offensive, which I really appreciate. Thankfully the controls are really responsive too. Besides the satisfaction of being good at the game, playing well will help you perform certain "challenges" in most of the acts. There are ones for getting a certain combo amount, performing perfect scenes (your combo doesn't drop the whole fight), rescuing the extras, and more. These are fairly fun and add something else to shoot for while playing. A few of them are pretty hard, depending on the enemies during the act. Besides the satisfaction of performing well, completing all three challenges in the act will reward you with a charm. Up to two charms can be equipped, each with different effects. They are basically the game's form of equipment, and they can make some of the challenges easier. Note that they charms are unlocked in the order listed, not for completing the challenges for the corresponding act. So to get the final charm, you will have to do them all, not just do the challenges for the final stage. Thankfully, the challenges do not have to all be completed in one run through the stage, so do what you can and come back for the ones you missed. Foul Play has 22 acts spread across 5 plays. The first run through the game takes about 6 hours or so. If you are aiming for full completion (all stars and charms), it would likely double that. As mentioned before, the game isn't that hard to complete. The only time I actually had trouble was the final boss, and that was until I figured out what to do to beat him. As long as you are defeating enemies and trying not to get hit, you can make your way through the game. The hard part is getting all the stars and completing all of the challenges to get the charms. For the most fun, I'd recommend playing the game co-op, as it will also make some of the requests easier. I did have a few problems with the game, though. Flying enemies (gargoyles, mermen, etc.) were sometimes annoying to hit, since they can float around the fighting plane and make it difficult to land an attack. Their movement also made jump attacks just as hard to land. If you are surrounded by a lot of enemies, or a few larger ones, it can be hard to know where you are. This can make it difficult to avoid hits, since you don't know if you are facing the right way, or out of the way of an attack. There are some boss attacks that are hard to avoid with all the action on-screen, too. Finally, when multiple enemies are attacking at once, the game decides which one you parry when you hit the button, not the enemy you are facing or the direction you are pressing. This lead to times where I intended to parry the smaller enemy for the safety of the flurry, or to throw them into the larger one, but would end up blocking the large enemy's attack and then get hit by the others. In the end, these were not enough to keep me from having fun with the game. Foul Play is all about putting on a show. Showing off fancy moves for the crowd and remaining untouched throughout a whole scene is fun and rewarding. For me, the concept is well thought out and executed. Combat is fun, even if I had a few problems. If you are a fan of side scrolling brawlers, give Foul Play a try, especially if you can bring a friend or find one online. It might be pretty short to run through it, but mastery will take time and make it even more fun.